Facebook has a new look and feel. Profiles can now have the new timeline, users get the choice to convert to the new timeline or stick to the old layout. The timeline was proposed in December 2011 and many users have already pampered themselves to the new look. The idea of the timeline first came to our attention back in September 2011 when it was announced at Facebook’s F8 conference. The timeline replaces traditional profiles with a scrolling timeline of your entire existence on Facebook from current day right back to the day you signed up. The Facebook Timeline web design layout is filled with status updates, wall posts, photos, videos and other material you’ve shared throughout your time on Facebook. There’s a feature were you can manually add information that has been missed. The Timeline offers a new private feature called Activity Log, which gives users the opportunity to review all their posts and activities. With the Activity Log you can alter your privacy settings using a drop-down menu that allows you to select if a particular item should be incorporated into the Timeline. 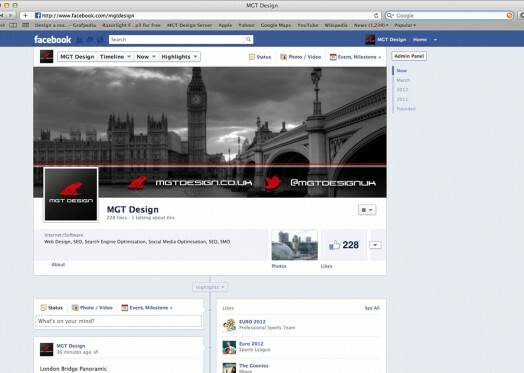 To convoy with the Timeline, Facebook refurbished the page design to give it a magazine look with a large cover photo at the beginning of the page which in fact looks more like a banner. The motive behind the web design change was to show more creativity and add a dose of life to your profile page. To the right of the Timeline is another timeline that keeps record of posts according to the year or month. The purpose of the Timeline is to make your profile page into a cyber diary where you can reminisce and look back at the activities that have taken place on your page.